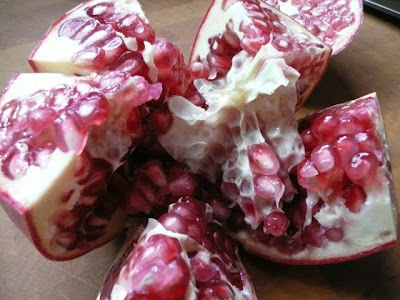 How to de-seed a POMegranate – not scary at all! | eat. live. travel. write. 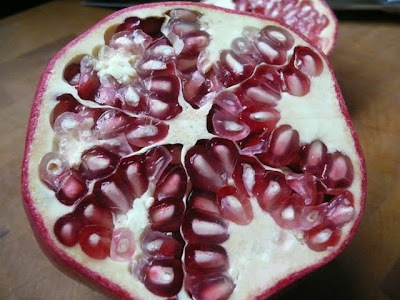 How to de-seed a POMegranate – not scary at all! So yesterday’s post, my entry in the 2009 POM Fresh Recipe contest, required me to seed a pomegranate. O-kay…..
• Cut – With a sharp paring knife, cut off the top about a half inch below the crown. • Score – Once the top has been removed, four to six sections of the pomegranate divided by white membrane will be visible. With the knife’s point, score the skin along each section. 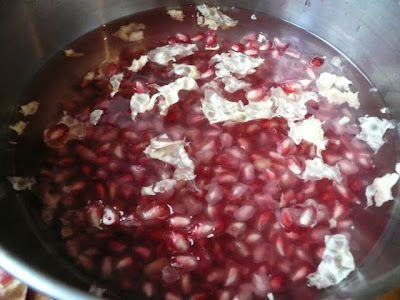 • Open – Using both hands, carefully pull the pomegranate apart, breaking it into smaller sections. • Loosen – Over a bowl of water, loosen the arils and allow them to drop freely into the bowl. The arils will sink to the bottom of the bowl and the membrane will float to the top. • Scoop – Use a spoon to scoop out the pieces of white membrane that have floated to the top of the water. • Strain – Pour the arils and remaining liquid through a strainer. Later, I Googled around and came up with some more advice from Elise at Simply Recipes. But the rest of her method is similar. You can read what she says here. In any case, it was definitely not as hard as I thought and you should certainly not be intimidated by it. 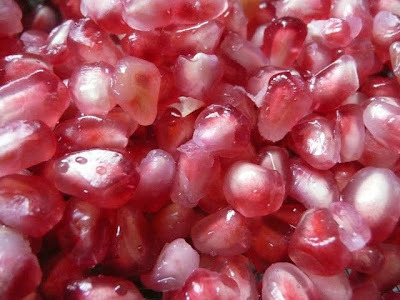 You will be rewarded with juicy, crunchy little pearls of sweetness. Don’t forget to head on over to the POM website and vote for my Red Roast Pork with POMegranate glaze. Click here (edited to add, link is no longer active). Thanks so much in advance! 12 Responses to How to de-seed a POMegranate – not scary at all! Duo – awwww – you guys are too sweet! I was expecting a Duo creation in there somewhere…. I have yet to do this but your post definitely helps me gain some confidence! Thanks! Great post! 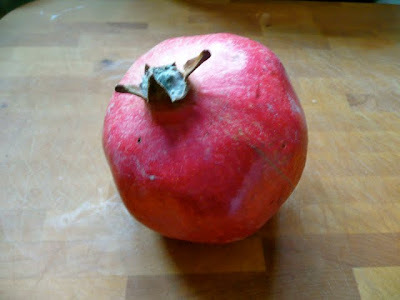 I recently tried a fresh pomegranate for the very first time, and I agree that it wasn't as hard as I had thought it would be. Now I'm hooked! The bowl of water method is definitely the best way to loosen the seeds easily and without any mess. Beats squirting it all over a cutting board or your best white apron. What a super helpful tip! I take to beating the heck out of my pomegranete with a wooden spoon, but this method looks way more efficient and less violent! Veggie Girl – it's so easy! Simply Life – it will be fine. Jen – I can see how you would be hooked.